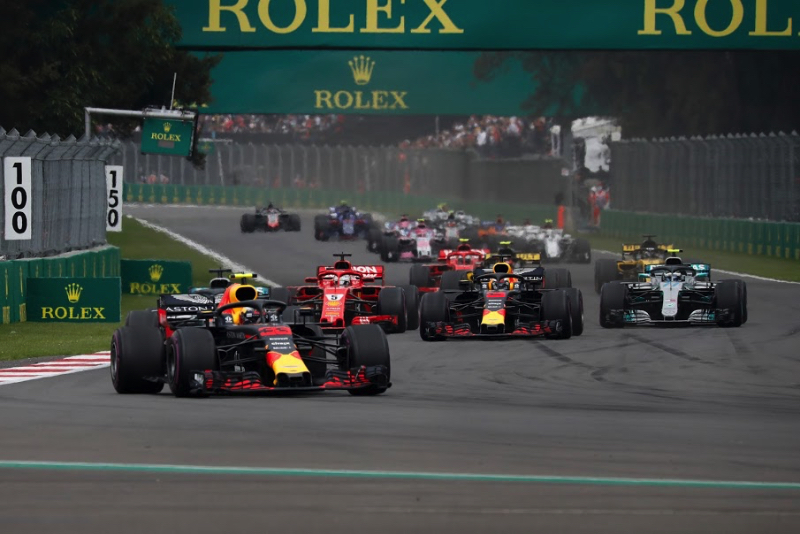 Max Verstappen and Lewis Hamilton were the stars of the Mexican Grand Prix – Verstappen for winning the race, and Hamilton for winning his fifth world championship. Here is how those victories unfolded. Red Bull locked out the front row of the grid for the first time in five years. Daniel Ricciardo took the pole, and Verstappen was second. Hamilton and Mercedes teammate Valtteri Bottas filled the second row of the grid. Ferrari's Sebastian Vettel and Kimi Raikkonen were in row three. By setting their best lap times in the Qualifying 2 session on Pirelli's ultra soft slicks, the top six drivers avoided having to use the far less durable hyper soft compound tires at the start of the race. Ricciardo got too much wheelspin when the red lights went out to start the 71-lap race, and he lost the chance of taking the lead. It's a long drag race down to Turn 1 where there has been mayhem in races past. There was some bumping and shoving further back in the pack, but the top six made it through the first turns okay. Verstappen was in the lead, ahead of Hamilton, Ricciardo, Vettel, Bottas and Raikkonen. The ultra soft tires were not holding up all that well, especially on Hamilton's car. He was the first of the six pack to pit for the super soft slicks, coming in at the end of lap 11. Ricciardo came in a lap later and Verstappen a lap after that. New race leader Vettel didn't make his pit stop until the end of lap 17. That put Verstappen back out front. How would the super soft tires last? Verstappen's engineer told him this would not be a straight forward race because there could be two or three more stops for tires. While not in contention for the top six, Mexico's Sergio Perez was in contention for the points until his Force India had brake problems and he had to retire after 38 laps. "It's a big shame to retire from my home grand prix – especially when things were looking really good in the race," he said. "I think we had at least seventh place in our pocket and the great strategy that we started planning yesterday in qualifying was really paying off. I feel sorry for the team and for the fans who have been incredible this week. They always make me feel very proud and today they gave me amazing support." Vettel was on the move and took second place from Hamilton who was really struggling with his car's handling. But Verstappen still held a comfortable lead. Hamilton and Vettel made their second stops at the end of lap 47 for sets of the ultra soft tires. Verstappen stopped at the end of lap 48 for a set of the super softs and kept the lead. The tires that came off of Verstappen's car did not look too bad, so Red Bull decided to have Ricciardo stay out and not make a second stop. On lap 50 Verstappen was in the lead while Ricciardo and Vettel battled for second place. Raikkonen was fourth and Hamilton fifth. Ten laps later Hamilton was practically coasting as he babied his car to the finish. "The race itself today was pretty horrible," Hamilton said. "I got a great start and was really working my way up, but then we were really struggling with the tires, both Valtteri (Bottas) and I. I was just trying to hold on and bring the car home." After 61 laps Ricciardo retired from second place with hydraulic problems. It was his eighth retirement of the season, nearly all of them because of power unit woes. Verstappen turned down his engine to avoid a similar problem that Ricciardo had. And he did and he crossed the line for the fifth win of his F1 career. "The start was the key," Verstappen said. "I didn't sleep very well last tonight, I was really determined to win today. Luckily, we did that. Amazing job by the team as well. We had the right tires available and the car was working really well." Ricciardo's retirement elevated Vettel to second and Raikkonen to third. It was an all-red podium with a Red Bull driver and two Ferrari drivers up there celebrating. "It was very far to Max and we had nothing to lose so we decided to do another pit stop," Vettel said. "It was very tight with Daniel and we benefitted from his retirement, but then it was very difficult to make the tires last for those 25 laps and I was thinking, given the first stint, it should have been easier. Second was the maximum today." After finishing first in the United States Grand Prix, Raikkonen wound up third in Mexico a week later. He had only pitted once. "It was not an easy race," he said. "I think the tires lasted pretty okay, obviously not the fastest anymore, but we made them last and managed to keep the position where we were and this was the best we could have got." Hamilton finished fourth and wrapped up his fifth world championship. "It's very hard to realize it at the moment," he said. "It's something I dreamed of, but I never in a million years thought I'd be standing here today a five-time world champion. I never knew that was going to happen and I am just so grateful to everyone who has helped me be here. I want to say a big thank you to all the fans here for making the Mexican Grand Prix as special as it is. And I want to say a big thank you to my team."